Police have fired water cannon, tear gas and rubber bullets to clear Taksim and Gezi Park of protesters and prevent them from returning. Sporadic clashes have then been taking place around the area. 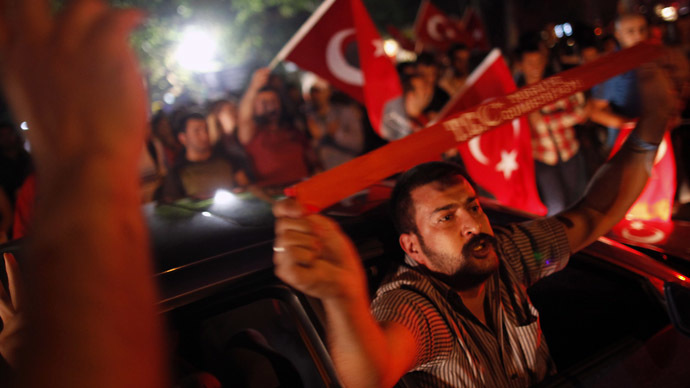 The news comes hours after Turkish Prime Minister Erdogan demanded the square to be “evacuated,” with protesters subsequently reporting over a hundred injuries, while the governor of Istanbul claimed the number to be closer to thirty. Several people have been taken away in ambulances after being loaded onto stretchers, RT’s Irina Galushko reported from Istanbul. Scores of riot police have sealed off Taksim Square and stormed the adjoining park, pressing the protesters out of the area. Backed by armored vehicles, the police chased the people out, while dozens of workers with bulldozers started clearing out the remnants of the protester's camp from the square. Municipality workers are now destroying tents in Gezi Park, all roads to the area were blocked by police. Water cannon was used to keep the people off the square in the surrounding streets. 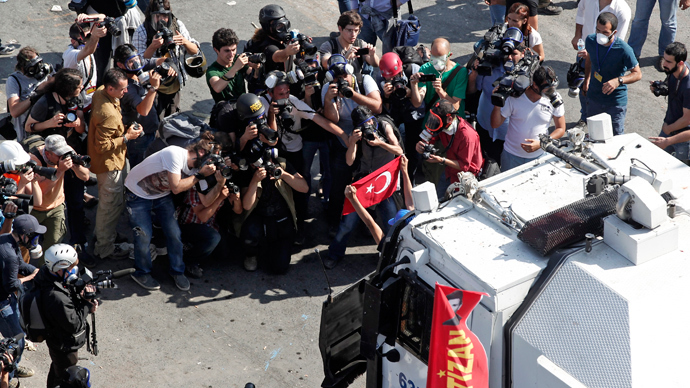 Even ambulance workers, as well as reporters, have been denied access to Gezi Park, RT’s Galushko tweeted. Dozens of people have been injured amidst the police action, while clashes with sporadic tear gas broke out in the streets, Today’s Zaman reporter Mahir Zeynalov tweets. Police vs people! Taksim, now: pic.twitter.com/8XjcEUhCFh This is huge! 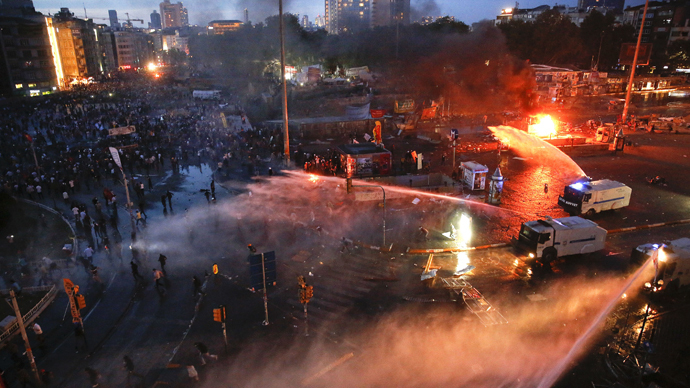 Clashes have been confirmed near the Fikirtepe metro-bus station. They have also taken place in Siraselviler, with police using tear gas and water cannon to prevent people from reaching Taksim again.Toward the night, Istanbul's major highways were also blocked - the D-100 and the TEM, with traffic at a standstill. Further to this, specialized police vehicles now roam Istanbul’s streets, and there are unconfirmed rumors of military police. Some protesters spoke of a police “massacre,” describing accounts of brutality in their Twitter posts, as several groups of protesters took shelter from tear gas in an adjacent hotel. But many have also reported being gassed in the actual hotel. Meanwhile, a Turkish public sector labor union has announced plans for a general strike on Monday, after Saturday’s events that included another police raid on Gezi Park. A spokesman for the Public Workers Unions Confederation (KESK) told Reuters: "We had already taken a decision to go on strike if there was an intervention on the park. So tomorrow we will declare a strike for Monday." The organization lists 240,000 members in 11 unions. Another group, called the Revolutionary Trade Unions (DISK) is also deliberating on whether to hold a strike, according to an official of theirs. Istanbul’s Taksim Square must be cleared of protesters before tomorrow’s pro-government rally, Turkish Prime Minister Erdogan stressed in his Ankara speech earlier on Saturday. This took place as thousands massed in the capital's Kennedy Avenue in a show of support for the demonstrators in Istanbul. “We have our Istanbul rally tomorrow. I say it clearly: Taksim Square must be evacuated, otherwise this country’s security forces know how to evacuate it,” Erdogan said in Ankara, as he announced the Sunday rally in support of his party AKP. Tens of thousands of cheering Erdogan supporters gathered in suburban Ankara for a rally titled ‘Respect for the National Will’. Erdogan once again took a hard stance on the anti-government demonstrators, saying he has reasons to call them “marauders,” and repeating the claims of protesters drinking alcohol in mosques and attacking women in hijabs. PM Erdogan is making one of the most angry speeches in a way describing the protestors capulcus, traitors, and playing another game etc. 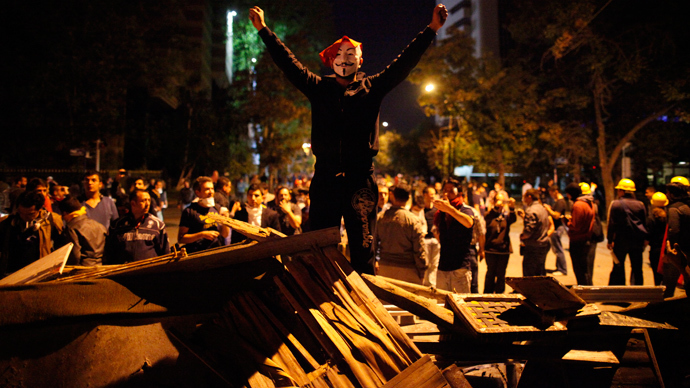 He also contrasted the violent unrest to the “peaceful” way his supporters act, praising them and the AK party members. 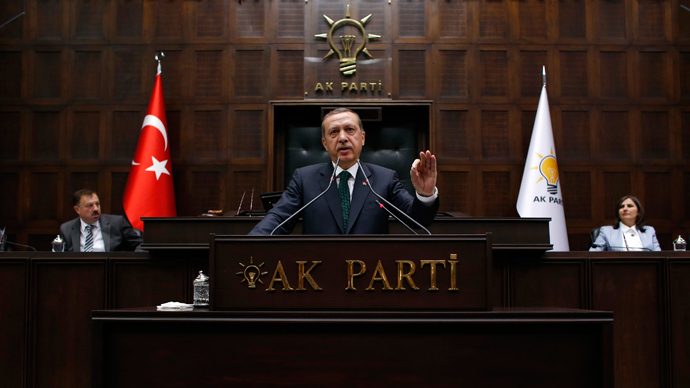 Erdogan then focused on a foreign support conspiracy, claiming the Turkish government has “all the evidence needed” of the “traitor scheme” behind the protests. “We will make public with documents that the real issue was not Gezi Park. 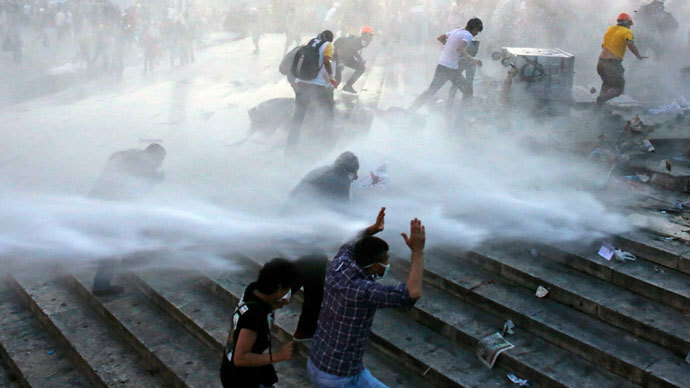 This is a coordinated process from the outside and the inside of the country,” the Turkish Prime Minister said, adding that some “illegal organizations” were behind the various “schemes” from the very start of the protests.